Happy New Year! I don’t know about you but this is a good time to increase smoothies, salads and all good foods. So many sweets and treats during the holidays so it feels good to get back into eating a bit healthier now. I am a believer of everything in moderation. I still like to enjoy my sweet foods but also know it important to limit them and eat an abundance of healthy foods. So let’s kick of 2018 with a great new smoothie recipe …this Tropical Smoothie! This Tropical Smoothie makes me want to be somewhere tropical at this time of the year…especially lately. It has been sooo cold here. It hasn’t been over 20 degrees in days. And this week doesn’t look like it will be much warmer. New York winter weather… I don’t love winter but I do like living where we have the change of seasons. And cold, snowy weather is one of those seasons. You can use plain water or coconut water in smoothies. Sometimes I like to use coconut water over plain water because it has more health benefits over plain water. It is low in calories, naturally fat and cholesterol free. And did you know coconut water is comparable in potassium with bananas? It is also super hydrating…all good stuff for us! If I have it in the house I use it but if not I just use plain water. I don’t like to add juice to my smoothies because of the added sugar found in many juices. 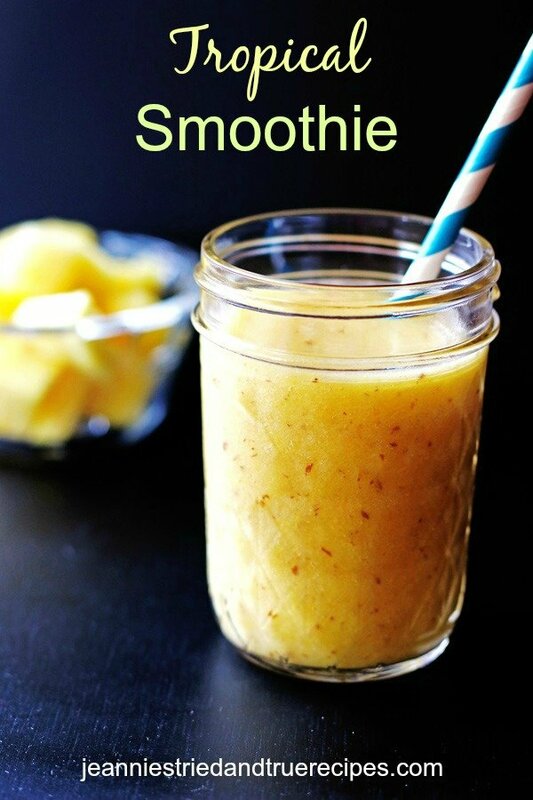 So easy to make this smoothie! Just place all the ingredients into your Blender. Blend until you get the consistency you like. Serve it right away so it is nice and chilled. Using some frozen fruit in your smoothie will help to chill it and make it a little thicker. This way you don’t need to add ice which can water down the delicious flavors of your fruit. 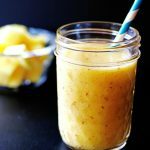 So make this wonderful Tropical Smoothie and dream of being somewhere warm and tropical…unless you are lucky to be somewhere warm right now! If so, soak up all that warmth and sunshine! Even though it is not Christmas anymore…the Grinchy Green Smoothie is a great green smoothie to try. My daughter had it and said she didn’t even realize there were greens in the smoothie! So it is a great one for kids too. Actually all the smoothies on my blog are kid friendly since my kids are my taste testers; I make them appeal to kids as well as adults. 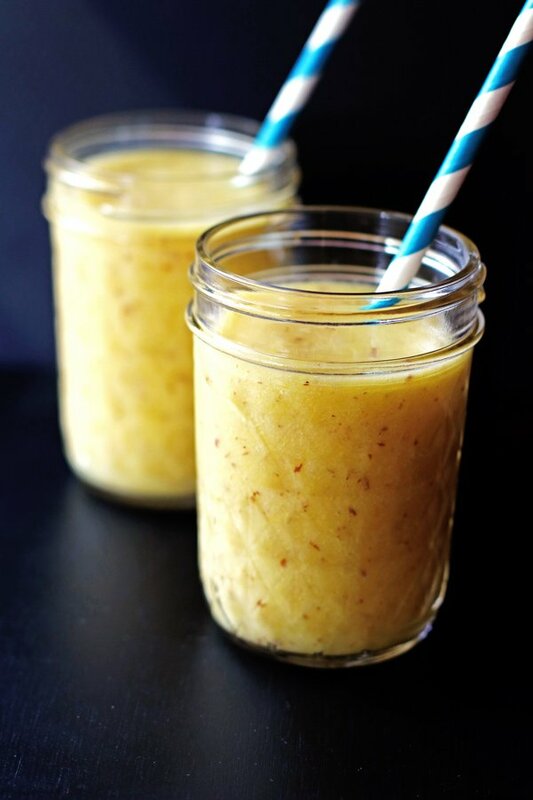 This refreshing smoothie is made with pineapple, mango and bananas. It is nutritious and delicious! Serve immediately. 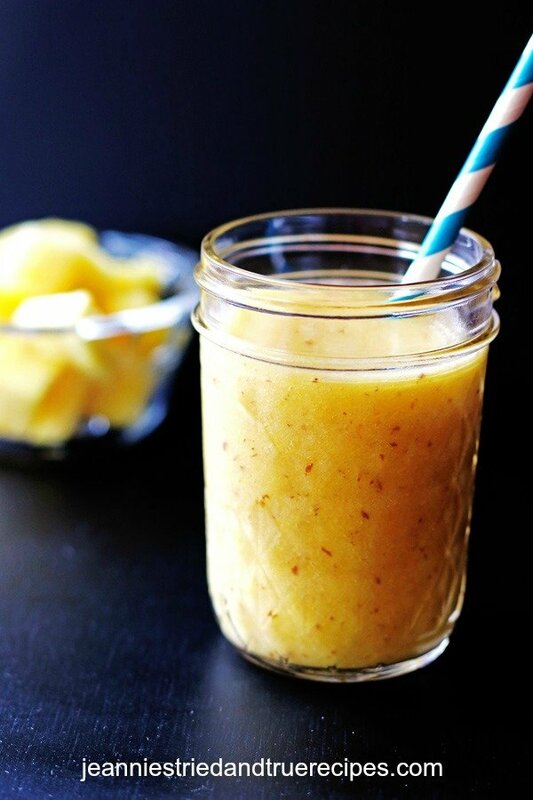 Store any leftover smoothie in the refrigerator. This smoothie looks so refreshing! Thanks Cheryl! It is refreshing and nutritious for us!